Children are sure to appreciate the comfort and support provided by Clinton Recovery Couches. These 24"-wide models will help students rest up and regain their strength. Clinton First Aid Recovery Couches will take good care of your students. They provide a cozy place for children to lie down in the school nurse's office. With 2" of foam padding and a wedge headrest, these medical cots will help students feel better in no time. A built-in paper dispenser lets you change the covering between uses to prevent the spread of germs. 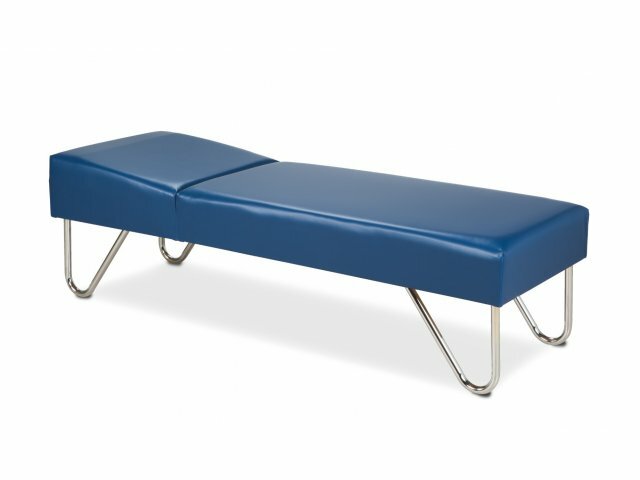 With a design that promotes hygienic, healthy conditions, these recovery couches are an ideal option for any medical setting. 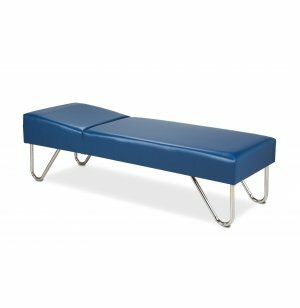 These durable medical cots provide the support your students need to recover quickly. The dual-frame construction features separate base and headrest sections with a middle reinforcement for added stability. Heavyweight upholstery is easy to clean so you can ensure that each child has a proper place to rest. Sleek Appearance: Chrome-plated round steel legs complement upholstery. Cozy Cushioning: The 2"-thick firm foam padding and wedge headrest facilitate a comfortable resting position. Tough Upholstery: Heavyweight, knit-backed upholstery will stand up to years of use and still look great. Colorful Selection: Available in a wide array of upholstery hues. Healthy Design: The paper dispenser makes it easy to get a new cot cover for each student, preventing germs from spreading. Sturdy Support: Dual-frame construction holds up the base and headrest separately with a middle support for additional strength.